This is a combo indoor and outdoor class; dress for the weather. Parents must attend with children under 10 years of age. Description: This class is both informative and fun! A continuation of Wilderness and Culture One, but it’s not a prerequisite. 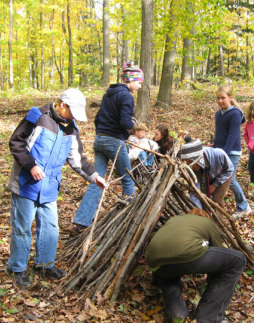 The class explores nature as well as studies how various cultures (primitive and modern) use and care for the wilderness, nature, and the land. Learn about nature and cultures through a variety of hands-on nature-exploration skills, weekly lesson topics, and monthly units. Topics include: Nature and Culture; Nature-Art; Handmake Stuff from Scratch from Nature, including cordage and baskets; Primitive Culture Wilderness Living; Primitive Culture Land Use and Land Care; Native American Stories; Modern Culture Land Use and Care; Nature Journal; Deep-Sensing Nature; Tracking and Awareness; Plant Identification; and Local Plants and Animals. During each class, students will be outdoors, studying nature. There will be outdoor and indoor parts to class. The class aims to help each student develop a (daily or weekly) routine of skills to continue to learn about nature in class and at home and wherever they go, during the school year and beyond. Expectations and Goals: 1. Students pass if they attend 80% of the days of class. 2. Test – required by Berrien Springs. Each student will take a pre-test (10-multiple choice questions), during the first class; and a post-test (same 10-multiple choice questions), during the last class. 3. Scrapbook – Journal, per each day of class. Each student writes and or draws a journal page – a “story of the day” of something the student learned about and or experienced in class that day. Thus, by the end of the semester, each student will have a 10-page journal (scrapbook) on the class. 4. Online quick assignment. At home, students read and look at pictures at a short online assignment, which reviews what was covered in class. Each assignment includes a quick quiz with 3 to 6 multiple choice questions. 5. Student Scrapbook – Journal, of the Semester. On the last day of class. On one sheet, each student writes about 3 things the student learned about during the semester. 6. Scrapbook – Photo Journal – group evidence of learning – required by Berrien Springs. Teacher will submit to Berrien Springs, a photo journal of class learning and activities. Teacher will email the photo journal to the students too. - Teacher provides class website, weekly paper info-sheets, nature books, outdoor nature, land, leaves, flowers, sticks, and more. - Required to bring to class (provided by student/family): dress for weather, class is indoors and or outdoors. Outdoor picnic style Workshop: bring a drinking water bottle, 3-ring binder, paper, pencils, clipboard. - Optional Materials (provided by student/family) Suggested optional stuff to bring: picnic blanket, color pencils, pens, markers, hat, snacks, camera.